The Adult roof rat has 3 possible color varieties, black to slate gray, tawny above with grayish white below, and tawny above with a lemon to white belly. Their muzzles are slender and pointed, their tails are longer than the head and body combined, their ears are large and prominent. Their average weight is 8-12 oz. Their young are smaller than the adult and have large heads and feet, and their tails are longer than the body. There are usually 6-8 young per litter and they have about 4-6 litters a year. Average life cycle s 1 year. Most of the Rats you see in pet stores are of the roof rat variety. Roof rats/Black rats live in any room or area of a house or commercial building, but are usually found nesting in attic spaces. They can climb trees, power poles, siding, even multi-storied buildings. Sometimes in the early evening they can be found walking the power lines and fences between structures. They seem to feel safer from predators at higher altitudes while engaging in their activities. Some roof rats known to inhabit high rise buildings have never seen the ground! The roof rat survives well on fruits, grains, and cereals. Treatment starts with a thorough inspection for the primary source of the infestation and any conducive conditions. After that recommendations are made for good sanitation practices and/or elimination of conducive conditions (sealing of rodent entry points). 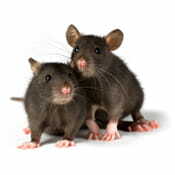 The best way to get rid of a Roof/Black rats infestation is to trap and remove the rats. This can take some time depending on the level of infestation. We maintain control by using baiting management techniques around the building. We always recommend rodent entry points be sealed such as crawlspace accesses, missing or broken screen vents, and gaps in the foundation. An inspection by trained and licensed expert is critical in effective rodent control.